Muthoot Finance Ltd, the country’s largest gold loan provider, has come out with non-convertible debentures (NCDs), the second such issue in less than six months. Through the current issue, the company is planning to raise upto ₹ 600 crore. 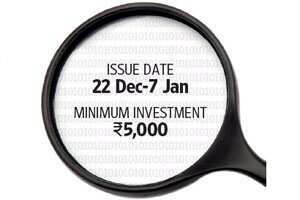 Of this, 40% is earmarked for retail investors. The NCDs are available for four maturity periods—two years, three years, five years and five-and-a-half years. The interest would be paid annually, except for NCDs with a maturity of five-and-a-half years for which the payment option is cumulative. While the earlier NCD issue was listed on both the National Stock Exchange and BSE Ltd, the current issue would be listed on BSE only in order to improve trading volumes. The current NCD issue doesn’t have the call or put options. The effective yield of NCDs maturing in two years is 13%; for those maturing in three and five years, the yield is 13.25%. NCDs maturing in five-and-a-half years will give the highest yield of 13.43% owing to the cumulative payout option. The post-tax return in case of two-year NCDs works out to be 11.7% for those in the 30.9% tax bracket. It works out to be 10.32% for those in the 20.6% tax bracket, and 9.02% for those in the lowest tax bracket of 10.3%. In case of three-year and five-year bonds, the post-tax returns would be 11.88%, 10.52% and 9.19% for the three respective tax brackets. For NCDs of five-and-a-half years, it would be 12.04%, 10.66% and 9.32% for the three tax brackets, respectively. How safe is the issue? Ratings: Muthoot NCDs have been rated AA-(stable) by ICRA Ltd and AA-/stable by Crisil Ltd. The ratings indicate very low credit risk as well as a high probability of timely interest payment. Company: Muthoot Finance is on a strong growth path and its profit after tax in the first six months of the current fiscal year stood at ₹ 406 crore compared with a profit of ₹ 494 crore during the whole of FY11. The capital adequacy ratio of the company stands at 18.24%, much above the regulatory requirement of 15%. However, the increasing level of non-performing asset (NPAs) is a problem area. The gross NPAs of the company were 0.59% in the first six months of FY12, up from 0.29% in entire FY11. While all its loans are securitized, a substantial correction in gold prices may adversely affect the loan recovery process, which in turn will hit the company’s financials. With the market expecting a reversal of the interest rate cycle soon, the Muthoot NCD is likely to be the last one offering such lucrative returns. Moreover, substantial correction in gold prices is unlikely anytime soon, which bodes well for the company.